You can create quick-picks for clinical note templates as needed. 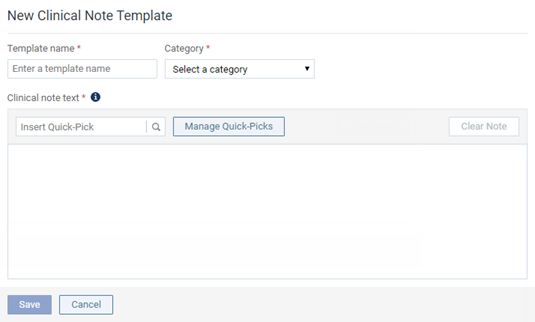 Quick-picks are location specific, so each location in your organization can have its own quick-picks. 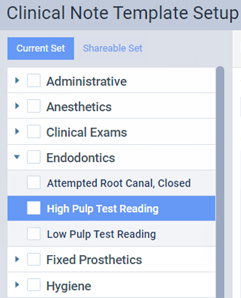 A location's quick-picks are available for adding to any of that location's clinical note templates. Click (or tap) Create New. 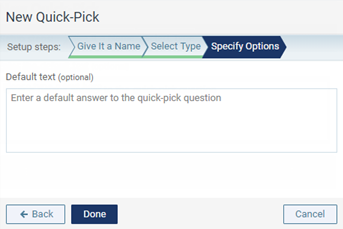 The options for creating a new quick-pick become available. Complete the steps to create the quick-pick. On the Give It a Name tab, type a name for the quick-pick, and type the question or statement for the quick-pick. Click (or tap) Next, or select the Select Type tab. 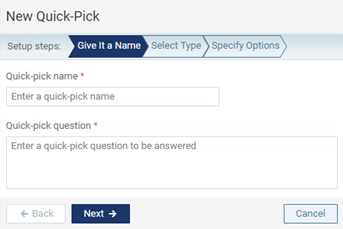 On the Select Type tab, select a response type for the quick-pick. Click (or tap) Next, or select the Specify Options tab. On the Specify Options tab, set up the options that correspond to the selected response type. Text - Type the answer that you want to have appear by default when the quick-pick is used to enter a clinical note. The text can be changed by the person entering the clinical note. Checkboxes - Type a possible answer for the question, and then click (or tap) the Enter key. 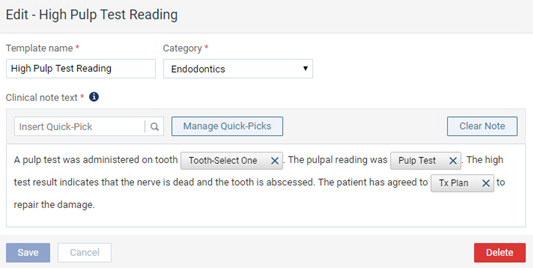 When the quick-pick is used to enter a clinical note, the specified text appears next to a check box that the user can select and clear. For any other answers that you want to add, click (or tap) Add Another Response, and then type the desired text. To remove an answer, click (or tap) the corresponding Remove button . To move an answer up or down in the list, click (or tap) the corresponding Move Up button or Move Down button . 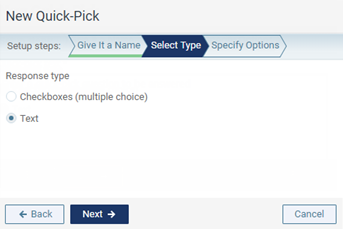 The newly-created quick-pick now appears and is selected in the Quick-Picks list. 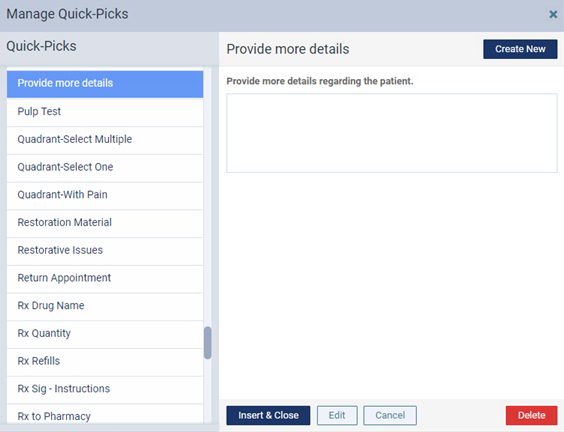 Click (or tap) Insert & Close to insert the selected quick-pick into the clinical note template or Cancel to close the dialog box without inserting the quick-pick.